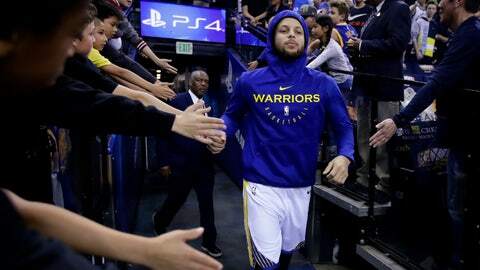 NEW ORLEANS (AP) — Warriors guard Stephen Curry left Tuesday night’s game against the Pelicans with what team officials say is a mild sprain of his right foot. The club says Curry was ruled out for the remainder of the game for precautionary reasons. Curry played nine minutes during the first quarter, scoring five points. When he subbed out of the game with less than three minutes remaining in the period, he walked past the bench and straight down the tunnel leading to the locker room. Curry joined several other Warriors stars who already had been ruled out before the game, including Kevin Durant with the flu, Klay Thompson with right knee soreness, Andre Iguodala with a sore toe on his left foot and Andrew Bogut for rest. The Warriors already have clinched the top playoff seed in the Western Conference and wrap up their regular season at Memphis on Wednesday night.